40-year-old female presented with abdominal pain in the bilateral lower quadrants with radiation to the back. She had some nausea and vomiting but no hemetemesis or melena. With the pain, she had fatigue, weight loss (2 notches on the belt over 6 months). No other symptoms including pulmonary. 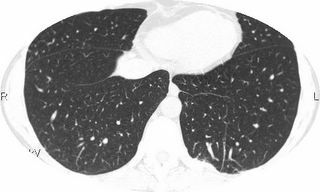 In 2002, the patient underwent an evaluation for bilateral pneumothoraces. Chest tubes were placed, and she had a prolonged hospital course. Her course was complicated by the discovery of a congenital hole in her right hemidiaphragm.and herniation/strangulation of a portion of her stomach into this area. She underwent closing of her diaphragmatic lesion and partial gastrectomy. 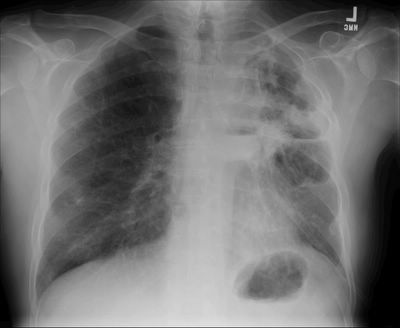 In 2005, she presented to an outside institution with a right-sided pleural effusion. 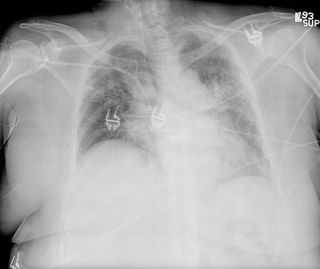 She had a thoracentesis, but an etiology was never determined. She did not followup. She reports her last chest x-ray was performed in May of 2005. She is unclear as to what this showed. PAST MEDICAL HISTORY: Uterine fibroids. PAST SURGICAL HISTORY: 1. 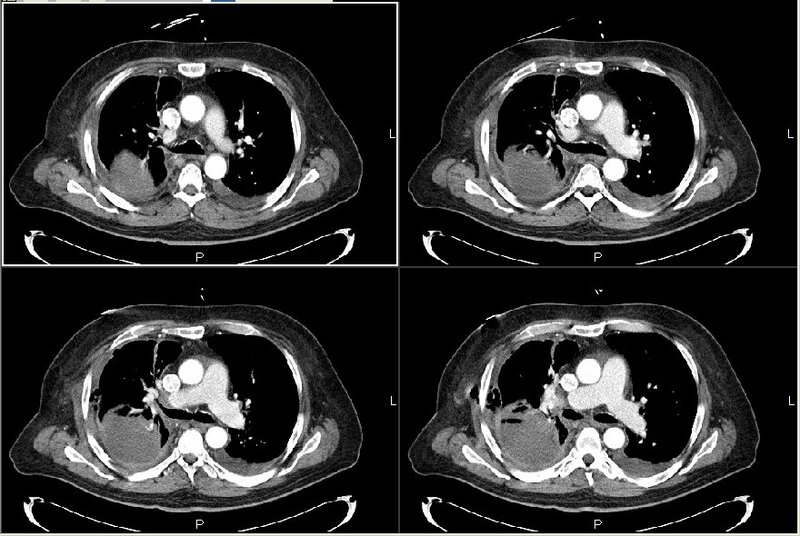 Surgical repair of right-sided hiatal hernia. 5. Congenital hearing abnormality. ALLERGIES: No known drug allergies. Exam: VSS, afebrile: Lungs: Decreased breath sounds on the right side from the base to the apex of her right lung. 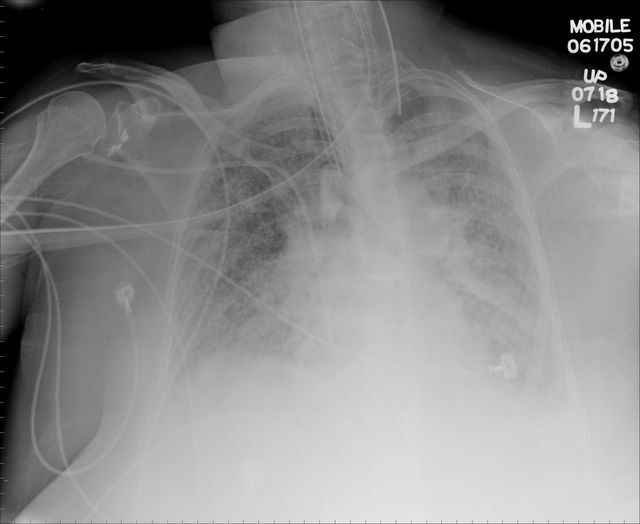 Her left lung was clear to auscultation without wheezes, crackles or rhonchi. There was right-sided decreased percussive resonance and decreased tactile fremitus. Abdomen: Soft, tender in the left lower quadrant without rebound or guarding. No masses appreciated. She has normoactive bowel sounds. What do you do next? What is your differential diagnosis? 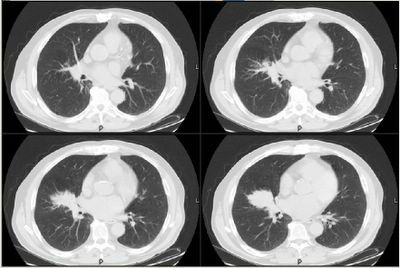 I posted this a while ago: this is the 77 y/o woman, non-smoker but extensive second-hand smoke exposure with the pulmonary nodule found on pre-op eval for a TKR. Her Pet was negative and she has had no other symptoms. 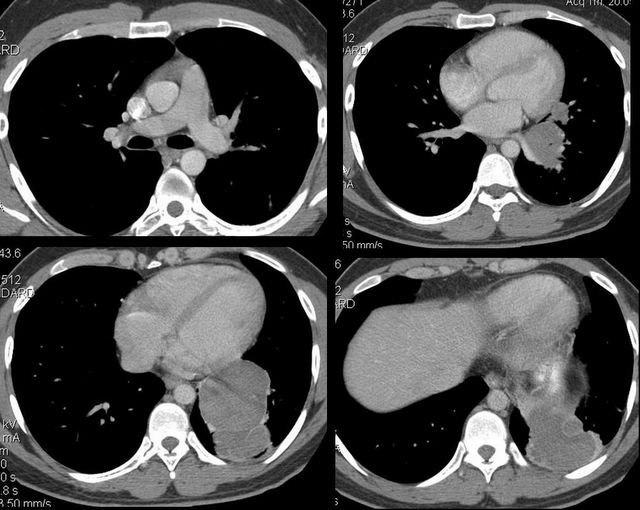 Would you even bother to follow her up to see if the nodule calcifies or would you be happy with the negative PET? Jeff H made some excellent comments on the original post. 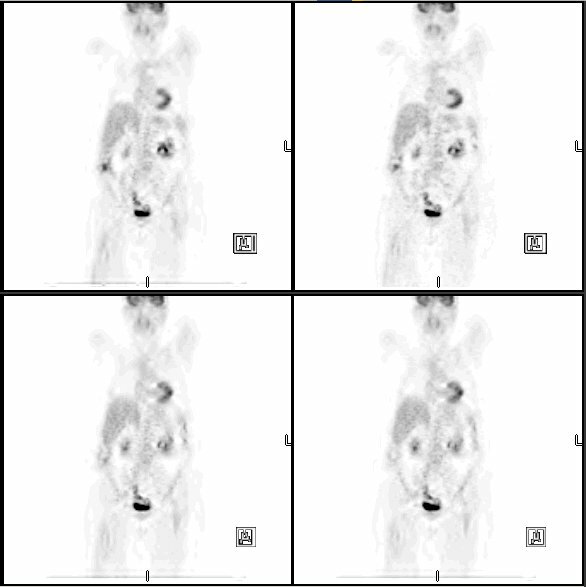 We were also puzzled by the shape of the lesion and its radiographic characteristics and their inconsistence with a fairly unremarkable bronch (x2). His mitral insuf. 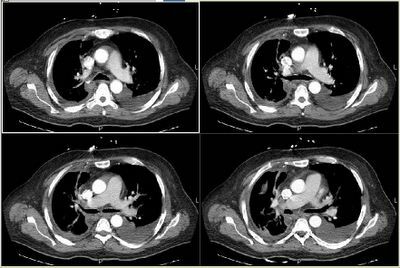 is only mild and the rest of the vascular structures on CT scan were unremarkable. Jeff H had suggested a PET. 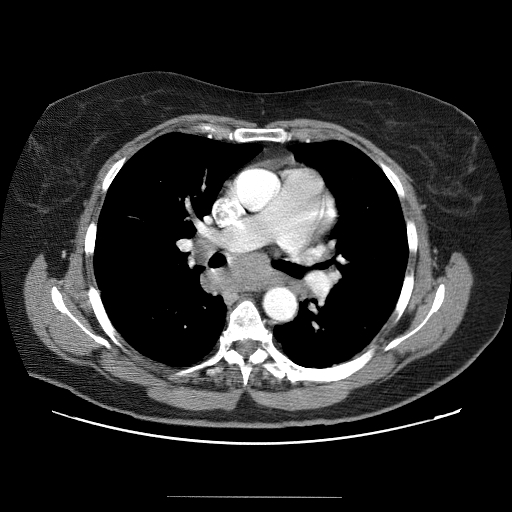 We were discussing the timing of a PEt and f/up with CT surgery when the patient came in through our ED this past Sunday with worsening dyspnea, cough (non-productive) and a fever to 104. This presentation is now only 20 days from that most recent CT scan on the previous post. I performed a thoracentesis and the fluid was turbid yellow with a lot of sediment. LDH was ~ 9,000, protein 4.3, glucose <10 and there were 17.9K WBCs with 97% PMNs. Gram stain showed WBCs but no organisms. I will post the first part of this new case today and some further info tomorrow. I am not trying to distract attention from Jennings' case but there are quite a few scans associated with this case. I bronch'ed him and other than an acute tracheobronchitis, he had widely patent airways and no endobronchial lesions. TBBx from the area were non-Dx. 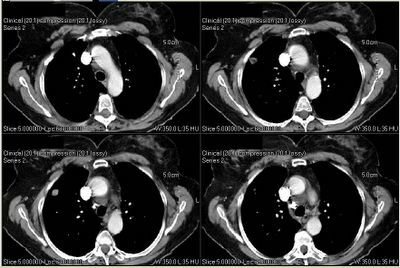 Since he was being evaluated for possible repair of his mitral valve, his CT surgeon asked us to re-bronch him. 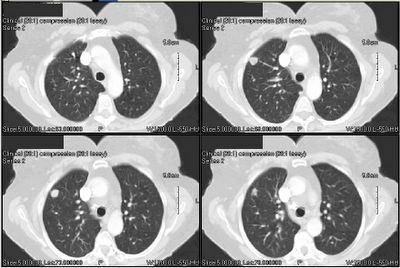 The tracheobronchitis was gone, airways were open and TBBx from the same area, BAL and washings were non-Dx. 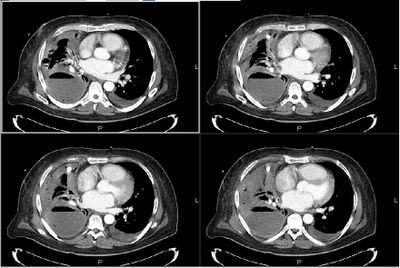 I saw in clinic a 62-year-old woman with no past medical history who first developed mild dyspnea on exertion about two months ago. She had just retired from her job working in a supermarket (lifting and moving boxes in the warehouse section). After walking up a flight of stairs, she became severely short of breath. She came to the ER, where a VQ scan was high probability. 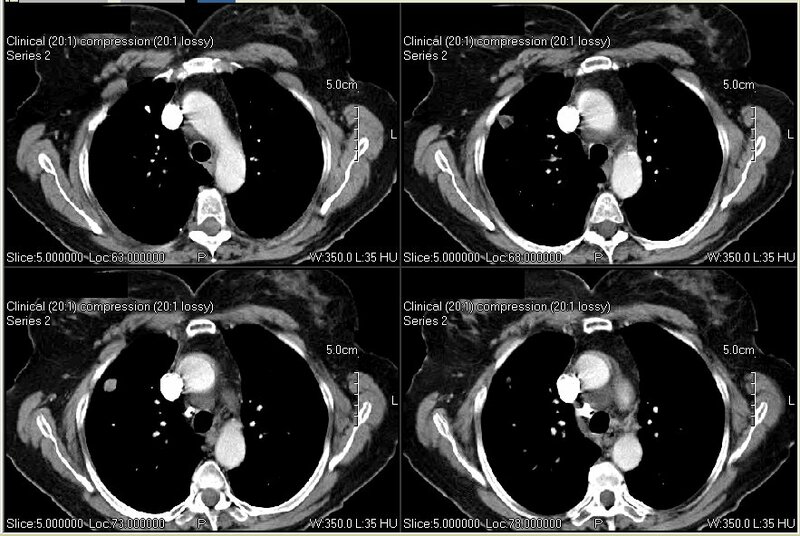 A pe-protocol CT was also done and it confirmed bilateral filling defects in a number of pulmonary arteries. She was started on Coumadin for this. Now she is left with fatigue and dyspnea on exertion. No weight loss or anorexia. 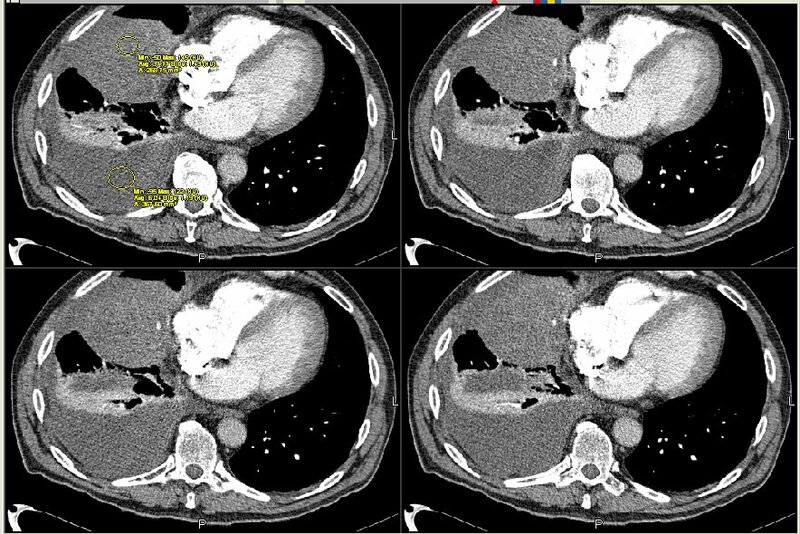 Here’s what the CT showed (click to enlarge them). SOCIAL HISTORY: The patient is a lifelong nonsmoker. PHYSICAL EXAMINATION: The patient is an obese white woman Weight: 277 pounds. Rest of exam unremarkable. It always happens to the nice ones (or the ones that JUST retired). This is the patient with self-reported PCN allergy. While waiting for the data on the Imipenem he was started on Zosyn and did very well. The organism was indeed sensitive to Imipenem and he has been switched to it and continues to tolerate it well. This is yet another good ilustration of all these self-reported allergies and how often patients get labeled with PCN allergy for life when all they had was a minor adverse reaction. 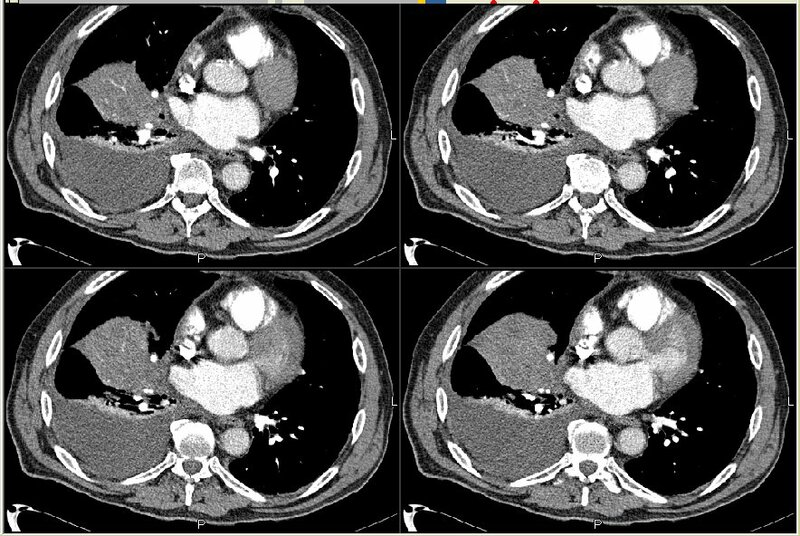 This is the follow up to the young woman with pleuritic pain and pulmonary nodules on CT.
F/U labs revealed normal Calcium and comp as well as normal CBC. ACE level was normal. Bronchoscopy w/ BAL and TBBX was performed. Cultures negative as well. Path on tissue revealed epitheloid granulomas. Fungal and AFB stains negative. 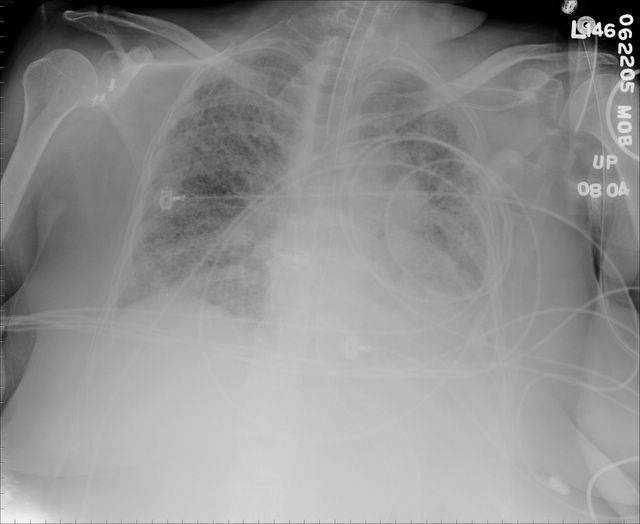 Unfortunately, endobronchial Bx's were not performed in this case. But, I thought it would be a good point of discussion. 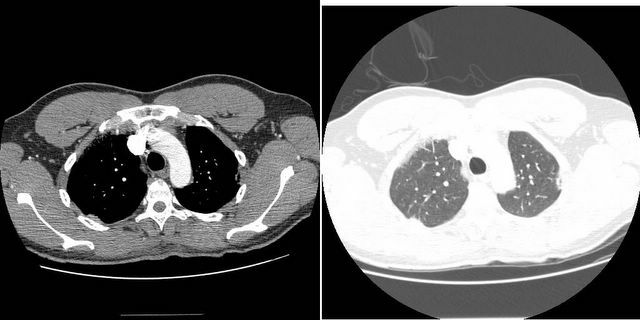 The literature suggests that, in addition to TBBXs, endobronchial Bx can increase your yield for diagnosis of sarcoid, more so if there is gross mucosal nodularity as shown in the image below from Mehta's review on this particular subject(Curr Opin Pulm Med 2003;9:402-407). 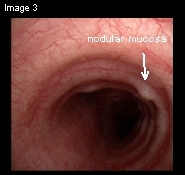 However, a diagnosis can still be made by biopsy of normal mucosa. This patient's pain and nephrolithiasis were attributed to sarcoid so she was placed on prednisone. I'll give you f/u when I get news from her caregiver. 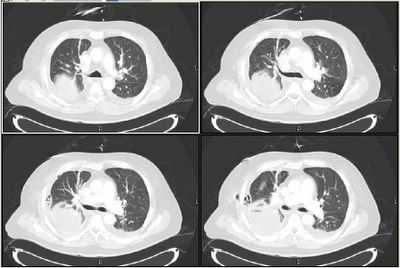 We were consulted on a 55 y/o man with stage IIIB bronchogenic Ca, S/P xRt and chemo. He also has mild COPD and had done fairly well with Chemo/radiation. He is ~8 months since the initial Dx and ~3 months since his last chemo. He now presents with fevers, SOB and cough productive of thick purulent sputum. 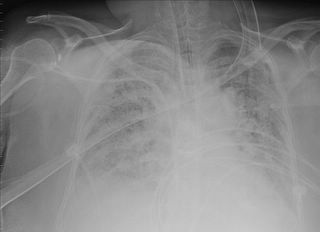 CxR as below. He was admitted and started on Ceftazidime. He reports a PCN allergy. Sputum Cxs have identified a MDR Pseudomonas aeruginosa. It is only sensitive to Piperacilin and aminoglycosides with intermediate sensitivity to Ceftazidime. I re-questioned him about the PCN allergy: in college he had an IM injection of PCN and had an immediate syncopal episode. No rash, no wheezing, no need for hospitalization. continue Ceftaz and add an AG? Document that this is likely not a real PCN allergy and start him on Pip (we only have Pip/Tazo) on formulary? Remember the patient who's case I just posted? Ok maybe she doesn't have DAH; here are three x rays you tell me what you think. On the other hand, her oxygen requirements are still high but the PEEP is down to 10 and the FiO2 is about 60-65%. For what it's worth, the BAL grew some Candida and another yeast not identified. I'm not sure what this means if anything. I guess this could be ARDS (with blood in BAL? ), but I want to put the current presentation together with her 2004 CT showing fibrosis. 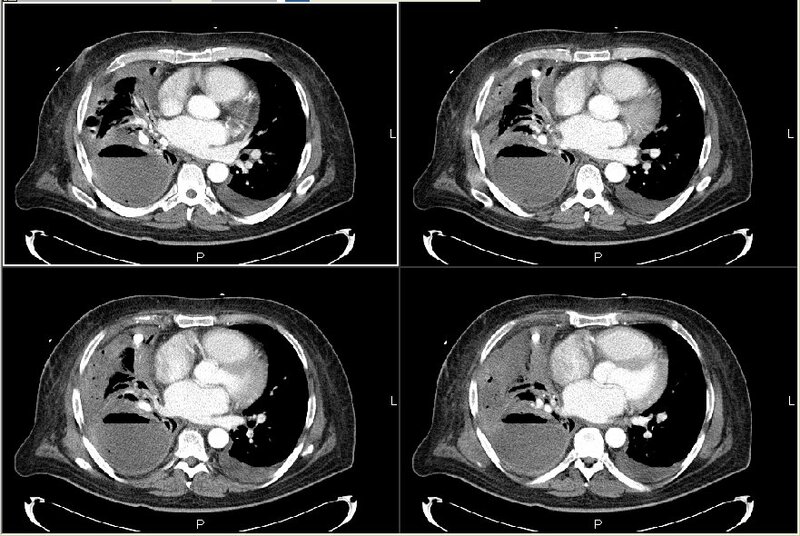 39-year-old woman with chief complaint of fatigue and pleurisy. 3 months ago had R. sinus infxn treated with Augmentin but persisted and was started on Azithromycin b/c of persistent symptoms. 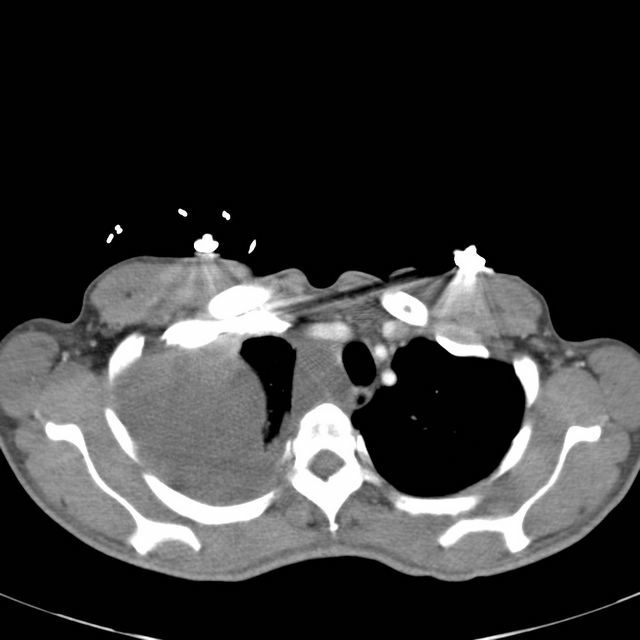 She presented to ED shortly thereafter with R. flank pain, nausea, vomiting and pleuritic chest pain. She had some cough streaked with blood. A CT Abd demonstrated multiple punctate caliceal stones and patchy air space opacities in the lower lobes noted on the higher cuts. Since her visit to the ED, she has had continued pleuritic chest pain R>L. She also feels more fatigue doing her regular work. Other Hx Asthma for last 4-5 years. Dx based upon peak flows no PFTs. Allergies. She has a 7-year history of smoking, but quit over 15 years ago. Two years ago, she owned several parakeets, but they resulted in allergies in her children and therefore she removed the animals from her home. Family history Notable for ulcerative colitis in her father, renal calculi inher sister. The patient has been found to have increased urinary calcium on recent studies reportedly. Medications Flovent 110 two puffs a day, albuterolor Maxair, which she uses less than once a month. Patient brought in follow up CT chest from OSH. 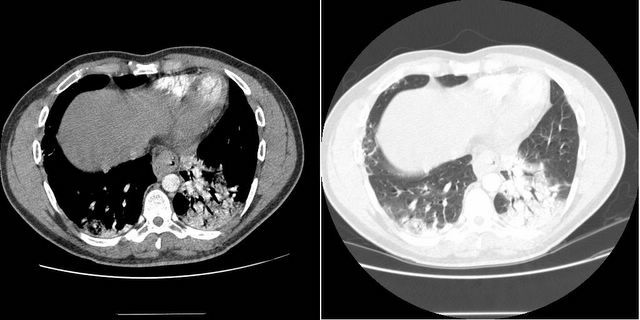 Physical exam Athletic, slim, woman appearing younger than stated age in no acute distress. Weight 136 pounds, blood pressure 118/64, pulse 84, and respirations 16. Exam is unremarkable. Data PPD (-) PFTs: Nl mechanics, volumes, gas exchange. What do you think of the CT? What's your differential? What would you do next? An echo at that time showed normal EF with normal-sized RV and RA. BNP 35. Since that time she has had a number of ER visits and 1 or 2 admissions for shortness of breath. Because she never follows up in any clinics, work-up is always ER-limited and treatment is usually based on the old CHF or COPD diagnosis with “pulmonary fibrosis” put into the past medical history, based on above CT. I assume that between visits for SOB exacerbation she is relatively ok, although on the review of systems from one ER note, she “aches all over:” with arthralgias. On SH 1 ½ PPD tobacco. No drugs or alcohol. 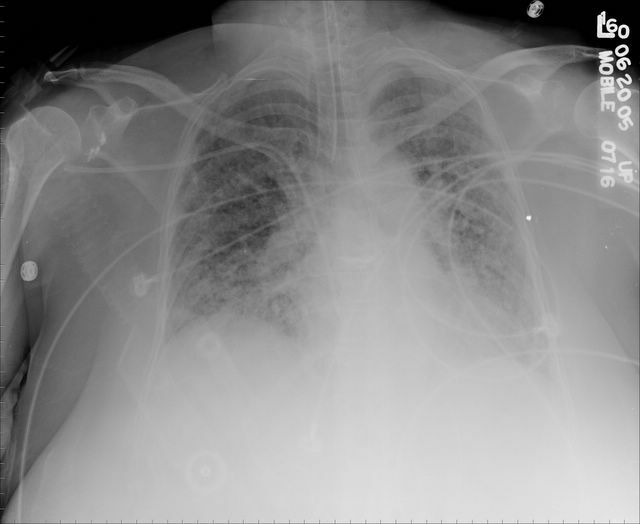 On this admission she presented with an hour or so of 9/10 chest pain with dyspnea. Vital signs in ER were 67/46, heart rate of 118, breathing at 22, temperature 36.5. 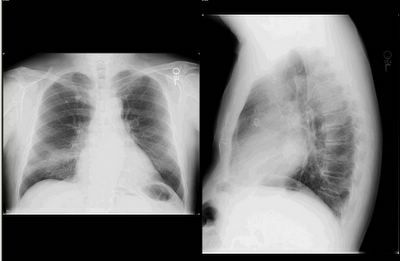 ABG 7.35/44/43 unknown FiO2. WBC 11. Hct 29. Platelets 200. D-Dimer 1000. INR 1.15. Cardiac workup was negative. Question: What is the cause of the xray findings? What would you do next if you were on rounds? Or you can ask me about any other data you might need. 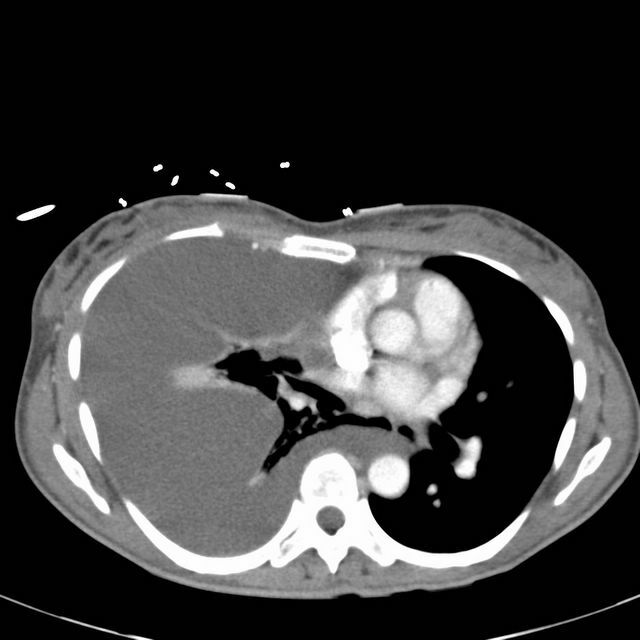 Conclusion to "26 year old with asthma"
We thought, given the mild eosinophila, his immigration history, and the cystic appearence on CT scan with what appeared to be multiple septae, that this could very well be an echinococcal cyst. 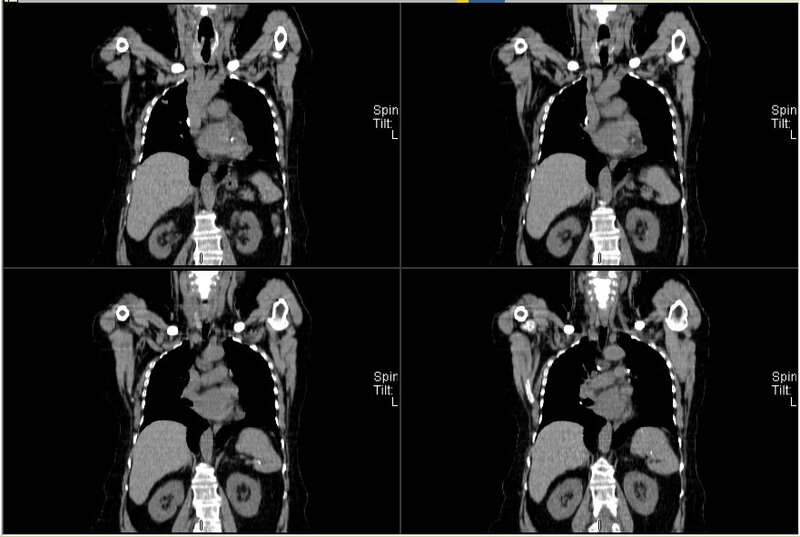 Other possibilities included malignancy (esp sarcoma), or sequestration (although we did not identify a feeding vessel). I did not show it, but there was one 2 cm calcified lesion in the liver. So, I presented his case to thoracic surgery for primary resection. Our surgeons asked for an ID opinion, which was obtained. Although review of the literature showed that percutaneous drainage may be an option for hydatid cysts in the liver, this has not been shown in the lung. The ID consultants agreed with primary resection, but we chose to treat for 3 months with albendazole first. 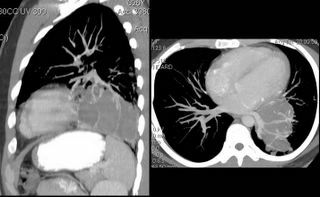 As seen, what we thought were septations were, in fact, vascular branches off of the left pulmonary artery. Additionally, she felt that the fluid density was not cystic (60 hounsfeld units). Now, the possibility of sarcoma came into play. CONCLUSION: I showed these films to our thoracic surgeon, who again balked, so I rephrased the question. I asked him to name any potential diagnosis of this lesion for which resection was not appropriate management. 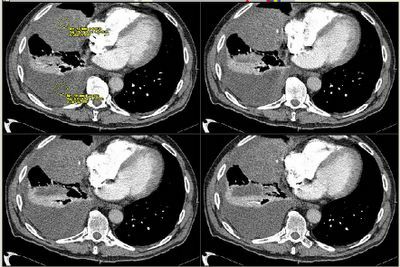 The patient was taken to the OR 2 weeks later, and a left lower lobectomy was done. GROSS PATH: multiple cystic lesions containing "thick green and brown material." 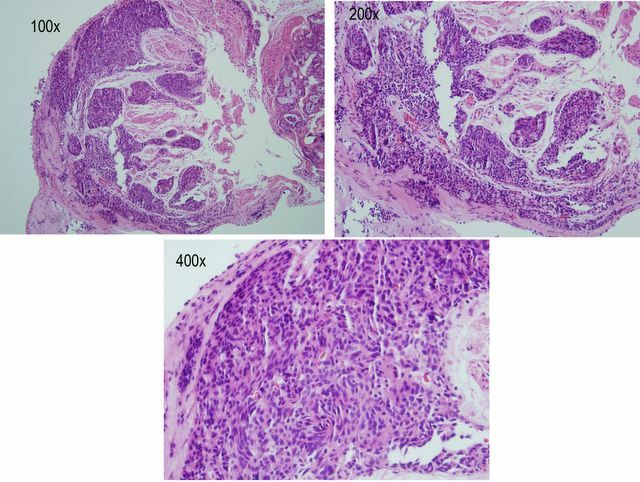 MICROSCOPIC DIAGNOSIS: bronchiectasis with eosinophilic abscesses. There were no parasites seen. There was no fungus. Cultures were negative. I saw the patient in follow-up last week, and we are both dissapointed at the lack of a definitive etiology for all of this. He feels well, although he stopped taking his meds and his airways obstruction has significantly worsened. He is off of the albendazole, and we have chosen to follow-up clinically and with periodic imaging to identify any potential new lesions at an early timepoint. Any other comments, thoughts, or suggestions? Hi, great blog by the way. We were wondering if you would post this question so we could get different opinions on the next step. 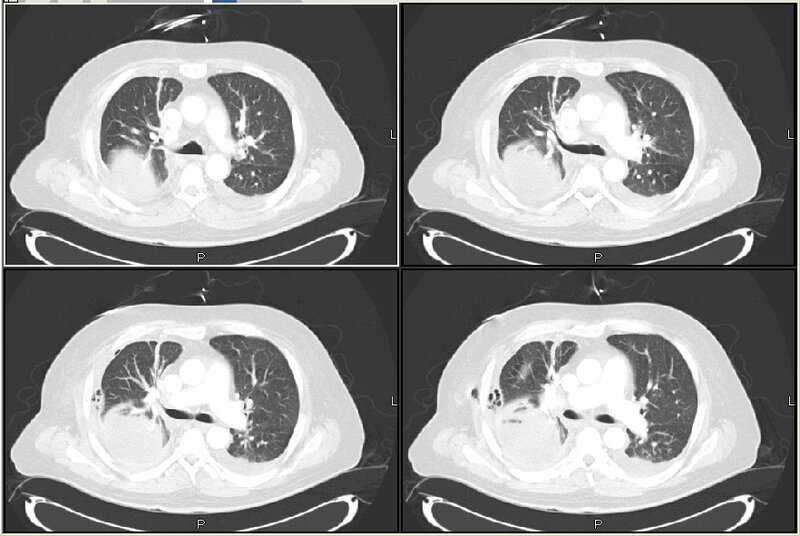 We have recently started to follow a 52 y/o woman with very severe COPD who is still smoking. She first came to our service as an in-patient with hypercapnic respiratory failure. On further follow-up we reviewed her history: 2 years ago she had a pulmonary mass identified. 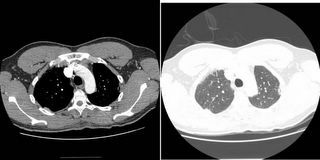 At the time her pulmonologist thought it was not safe to do any procedures for diagnosis and she had empiric xRt to the area. She has since followed with her primary care and has multiple hilar and mediastinal nodes that are PET positive. The orginial mass has shrunk and is no longer seen on CAT scan. 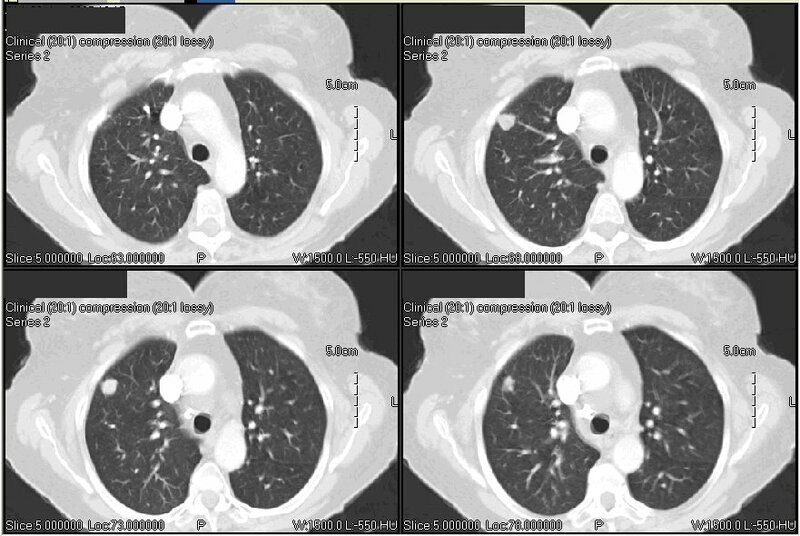 We performed a bronch: no endobronchial lesions with non-diagnostic samples. Her FEV1 is around 22% (0.5L). What, if anything, would you offer her next? Thanks. see the original case. I will also edit the original case to include this, but comments should be added here. I was called by a prominant chest radiologist before I saw the patient. 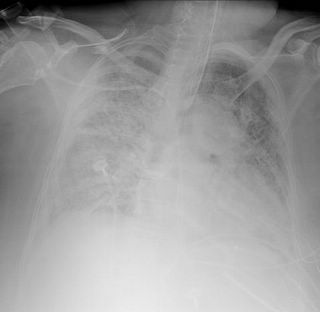 He told me that the patient had a left lower lobe pneumonia and possibly some central bronchiectasis. So, combined with his spirometry, I obtained studies to evaluate for ABPA (these were negative) and gave a burst and taper of prednisone for his untreated asthma. Because, clinically he had nothing to suggest a pneumonia, I ordered a CT scan.I saw him back in clinic 2 weeks later. It is interesting haow we have all thought about using PET as a tie-breaker. It is also interesting that SPN algoriths (such as from http://www.chestx-ray.com/SPN/SPNProb.html) don't have an entry for second-hand smoking. 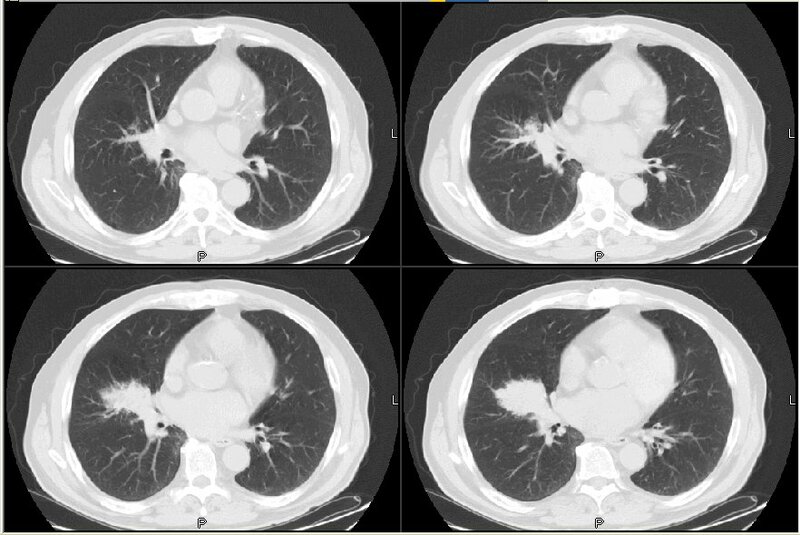 If you enter har data as a non-smoker (SHE has never smoked) the probability of malignacy adds up to 26-27%.I had a long discussion with the patient and presented the same options you have suggested. She still wanted to have the knee fixed. That was done the very next day. We are getting a PET scan and she will then see the surgeons. I will keep you updated as a separate post. HC wants input on what to do with this patient. 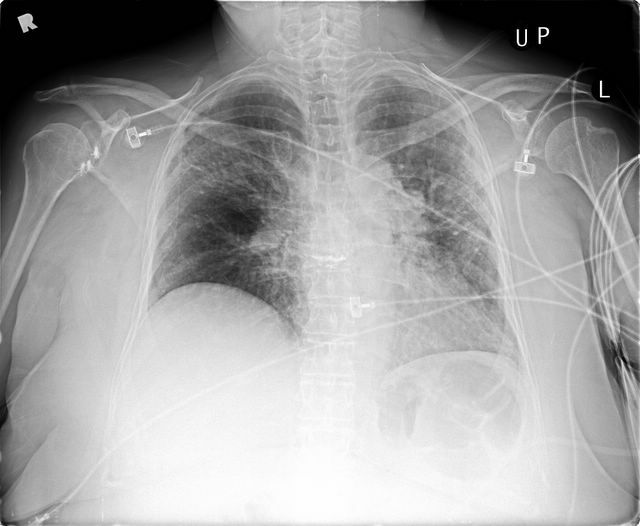 30 year old man no PmHx with 3 months of fevers and malaise. HIV negative. CBC has a normal diff without eos. Based on CT below, bronch attempted but he desatted to the mid 80's so it was aborted. What would you do next? What do you think this could be? This is a fairly straightforward case with a focus on sequence of interventions. This is a 77 y/o woman with no previous label of chronic lung disease. She had rheumatic fever and hystoplasmosis in the 50's, has mild HTN but is otherwise fairly healthy. 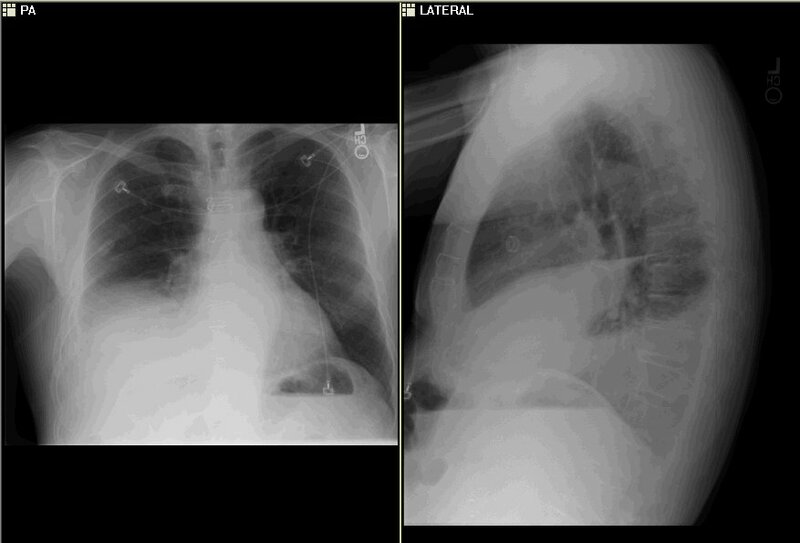 She was sent to me for a pre-op evaluation: prior to total knee replacement she had a CxR that revealed "a lesion". 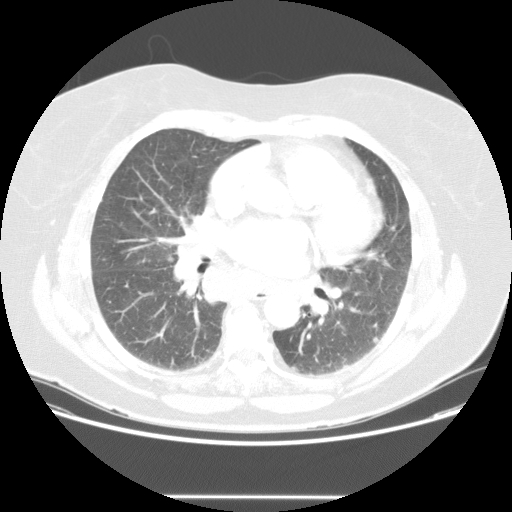 A CT scan was performed and revealed a pulmonary nodule (see below). She has no cough, no fever/chills/night sweats. Surgery was scheduled for the day after her consult with me. PMHx: as above. Only meds are anti-HTN. SHx: She has never smoked. No ETOH, no IVDA. No occupational exposures. Her husband was a heavy smoker and died of lung Ca and COPD. FHx: No Hx of solid organ tumors. Fairly normal exam, slightly overweight but clear lungs. Full PFTs were normal (good flow-volume loop). CT scan showed only the nodule seen below. She is clearly OK to go through surgery from a respiratory "mechanic" point of view. But what would you do with the nodule? How would you time your work up. Ok--here's an interesting one that I've been following for the past few months. I'm going to present things in steps as they actually unfolded in the evaluation, and let people chime in at each step. So, I'll present some of the information, then stop for comments, then edit the post to include new information, and leave a day or two for more comments. Since this is a Friday afternoon, I won't add new information until Tuesday, so check back. Here's the case: 26 year old man presented for evaluation of dyspnea for several years. He had been diagnosed with asthma at some point in the past, but had not been on treatment until a few months prior to his presentation. On his initial visit, he was taking a combination short-acting beta-agonist (salbumatol) and inhaled steroid that he had been given while visiting his family in India (he immigrated to the U.S. 4 years ago. He had no acute complaints other than his dyspnea. He had no functional limitation, but noted intermittant wheezing for the past six years (worse with cold or humid weather). Additionally, he had a daily cough productive of "yellow/brown" sputum. The cough is worse in the morning. His past history, other than the "asthma" was unremarkable until two years ago when he was admitted to a hospital and treated for pneumonia. About a year ago, he saw another pulmonologist who he said didn't really do anything (said pulmonologist called me to say that he had ordered a number of tests, but that the patient never followed up due to a lack of insurance). Social Hx: Grew up in India, and recently traveled to India for 2 weeks. Smoked 3 packs/week for 5 years, quit one year ago. College educated, works in an office without any known occupational exposures. He has no pets. No family/surgical history. No meds except the combination inhaler. No drug allergies. On exam, he was a WD/WN man, comfortable, no distress. There was no accessory muscle use. His chest expands symmetrically with inspiration.There is no dullness to percussion or egophony. There are decreased breathsounds noted at the left base along with diffuse inspiratory and expiratorywheezes. There are no rales or rhonchi. The remainder of the exam was normal. Spirometry: FVC :3.56 (64%) FEV1: 1.78 (41%) FEV1/FVC: 50% There was no significant change following a bronchodilator challenge. 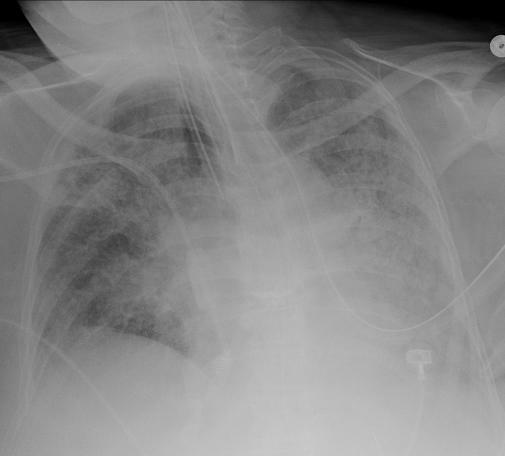 This ends the first part of the case: any comments on the CXR, or on diagnostic/therapeutic steps that you would take. I was called by a prominant chest radiologist before I saw the patient. He told me that the patient had a left lower lobe pneumonia and possibly some central bronchiectasis. So, combined with his spirometry, I obtained studies to evaluate for ABPA (these were negative) and gave a burst and taper of prednisone for his untreated asthma. Because, clinically he had nothing to suggest a pneumonia, I ordered a CT scan. 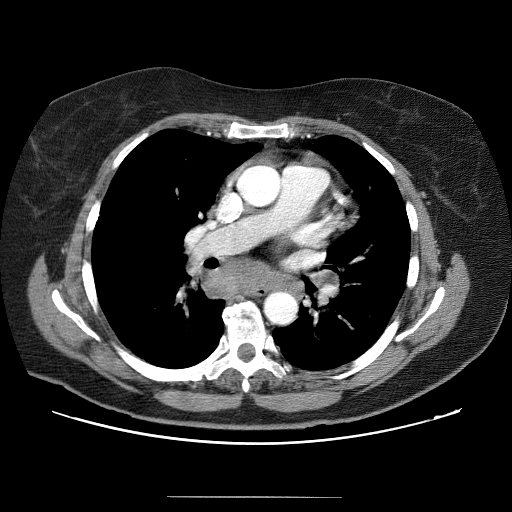 33 yo female with PMH of reactive airway disease since childhood. She has been on corticosteroids for the last 15-20 years with frequent bursts/tapers. Her lowest dose was prednisone equivalent of 5 mg. She is seen in the ER at least 4-5 times/month for exacerbations at which she gets burst of steroids, NMT's x 2 or 3 and is discharged home. She has been admitted only 1 x in the last 5 years. She had allergy testing as a teenager and was "allergic 4+ to almost everything they tested." Unfortunately, after multiple rounds of allergy shots, she still is not any better. Her home is mostly wood floors and her father dusts weekly. She lives in a major metropolitan city. She does not work because of her asthma. She denies any domestic violence. Has that upper airway wheeze which starts when I put on my stethoscope. Also with distant lung sounds. Unable to distinguish any other sounds in her chest because of her upper airway wheezing. I sent her to the speech pathologist and she definitely has some laryngeal dyskinesia, but it is "not very severe and should be treated after 4-5 sessions." I need any input on this one. 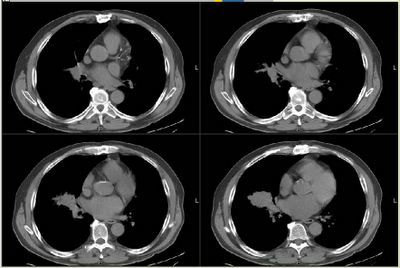 Remember the woman with dyspnea and isolated DLCO? Well, all I have with this dyspneic (on exertion) patient is a low DLCO and an abnormal anerobic threshold, both of which are real - so what would you do next? I'm at a loss. I re-arranged the blog code so that when you re-visit the blog, it will tell you if there are any new comments added (for each post) since the last time you were here. Obviously, the first time you visit, all comments will be new. They will remain new until you read the comments. Note that you must have cookies enabled for this to work. reflux, cold intolerance, e.g. coldness/pain in fingers in response to cold, and thickened skin in her fingers. 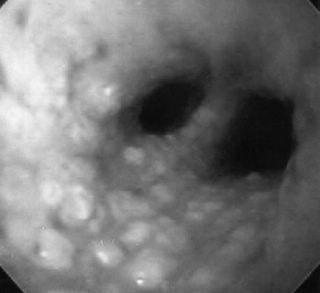 She also reports some dysphagis and a barium swallow in Jamaica, which was consistent with dysphagia. PmHx HTN and a thyroid problem. Exam - clear lungs. O/W unremarkable exam. PFTs - moderate restriction and DLCO 70%. ANA weakly positive; RF 30 (<15). 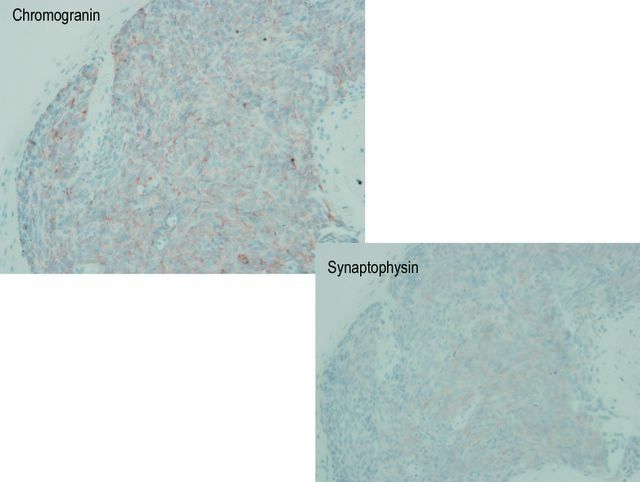 SSA/Ro antibody negative; Scl-70 antibody negative. HRCT from Jamaica shows bibasilar some interlobular thickening, some gnd glass and a bit of honeycoming. Rest of the paranchyma was normal or with very minimal ILD findings. BAL: micro negative. 90 WBC with 95% macrophages. Excellent comments and ideas on the surgery unmasking or leading to a metabolic disorder. The patient had developed a similar episode after surgery. Prior to surgery she had the standard high-fat, high-starch obesity-related diet. After the surgery she was asked to follow a relatively higher-protein, low-cal and certainly low starch, diet. This unmasked an Ornithine Transcarbamylase deficiency (she had already been tested by the time of this presentation). This leads to high ammonia (hers was real and remained >200-300 prior to transfer to us) levels that worsen in catabolic states (her pneumonia) and with high protein intake (like her post surgery diet). Treatment includes a steady intake of calories/carbs to prevent further muscle breakdown, lactulose is only partially effective since this is truly endogenous and not from translocation, and aceptors of nitrogen / urea compounds. We did manage to bring down the ammonia with these measures and she actually had an improvement in MS with eye opening to verbal stimuli and more vigorous withdrawal to stimuli. Unfortunately, with her very poor performance status and malnutrition, she became septic, eventually developed renal failure, ALI and MOSF and expired. After drainage through the pig-tail catheter he has had marked symptomatic improvement. Pleural fluid cultures grew alpha-hemolytic Strep and Bacteroides fragilis. He is still on Zosyn. 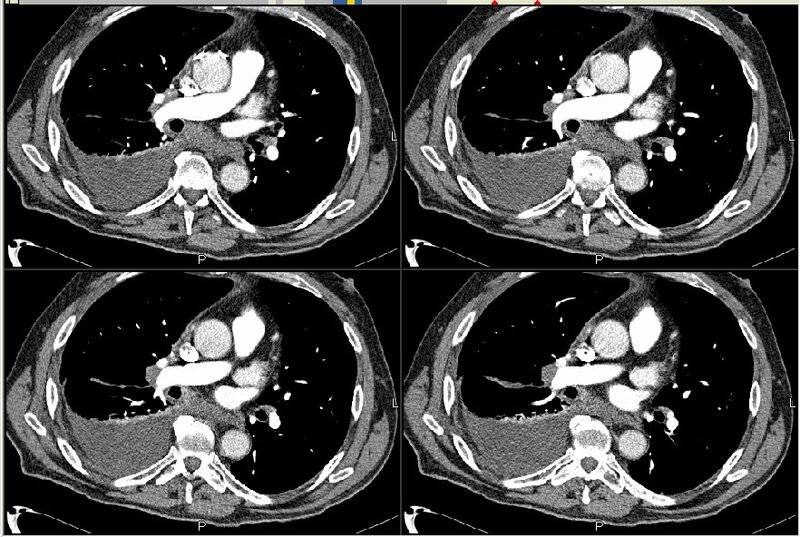 As you can see on the scans the major fluid pocket on the left is completely resolved (with thickened pleural and areas of air-space consolidation). He is still going to have surgical decortication but at cardiology's request this will be delayed so he can stay on Plavix/ASA a little longer to prevent hyper-acute stent closure. I will close this post as mixed flora empyema in the setting of previous chest tube for empyema. 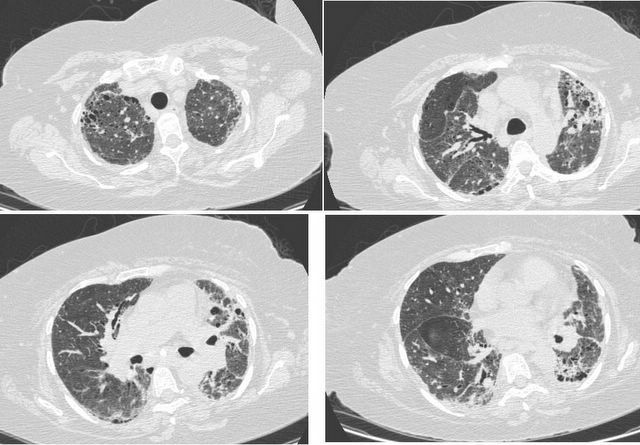 Perhaps surgical evaluation during his initial presentation to the OSH would have prevented this progression. If there are any new scans or events I will post them as a separate post at a later time. This is a complex case. This 59 y/o woman had a long history of morbid obesity with OSA, OHV and all the other associated problems. About 1.5 years ago she underwent bariatric surgery and lost >100 lbs. One year ago she presented to an outside hospital with comma was treated in their ICU (I am deliberately making this previous episode vague) and eventually recovered. She presented this time to one of the small outlying hospitals with fever, chills and cough with purulent sputum. 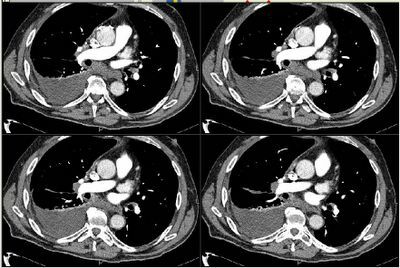 A pulmonary infiltrate was identified. Despite adequate ABTx her overall status (particularly MS) continued to decline. She became comatose and on the day of her transfer had a tonic-clonic seizure. She was intubated and I was contacted as they don't have EEG and full time neuro back-up. On arrival she was comatose, intubated on mech. vent., quite emaciated with mild anasarca. Ronchorous lungs, tachycardic, benign abdomen. CxR confirmed a pneumonia. Blood Cxs had been negative with sputum + for MRSA. Blood work of note from the OSH: hyponatremia to 128, normal BUN/Creat, good oxygenation, negative cardiac enzymes, LFTs remarkable for albumin 1.9 and ammonia 300. Normal AST/ALT and coags. Seizure activity was controlled after initial Ativan and Dilantin load. Any ideas? Was that patient reading our blog right about neuromuscular disease after all? Echo: Atypical septal motion, (subtle) inferior wall hypokinesis. Left ventricular function preserved at 52-55%. Mild prominent right sided chambers. 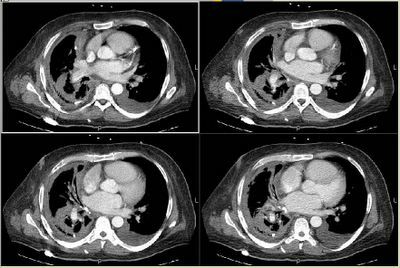 PERICARDIUM: Small pericardial effusion. 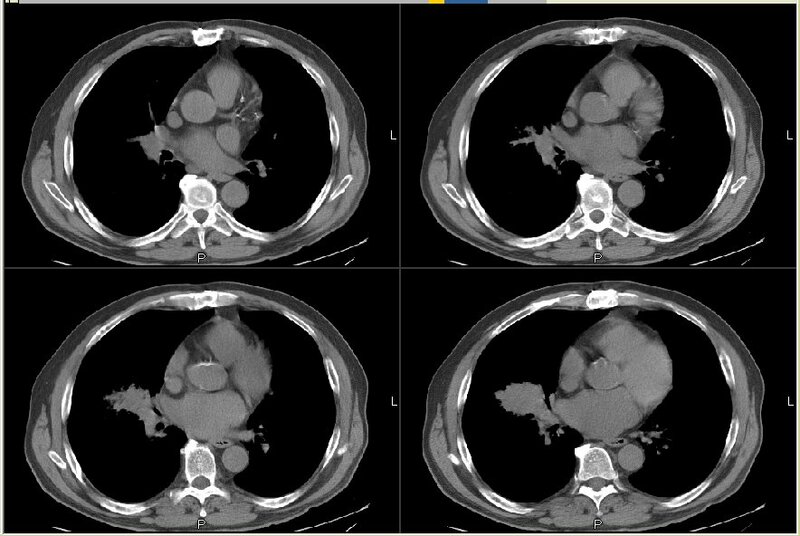 COMMENTS: Consistent with mild pulmonary hypertension. These are all improved significantly, and her flows are now better than her inital post-bronchodilator values. Now, there is no response to bronchodilator challenge. Finally, her CPET is confusing! Her lactate increased to 5.8, but no clear AT was identified. Her HRR and O2 pulse were normal. But, sheh did have a mechanical ventilatory limitation, with elevated ventilatory equivalents and a decreased ventilatory reserve. Finally, her Vd/Vt increased with exercise. Also, there were mild inferior ST segment changes (consistent with her echo). I'm not good with CPETs, but FJM said that "Study could support a cardiac limitation plus pulmonary mechanical limitation. A neuromuscular limitation could account for the latter." So--any more thoughts? Looks like I've treated her airways obstruction. I'll see her next week and see if she's feeling better. I'm thinking that w/u for neuromuscular disease may actually be in order. See original post, to which this followup refers. Based upon a paper by Winterbauer et al. 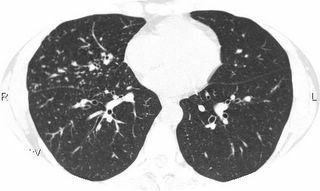 Ann Intern Med 1979; 78:65 where he examined 5000+ pateints with sarcoidosis, lymphoma, TB, and metastatic ca, I decided to watch. 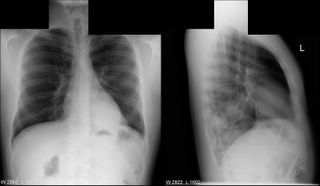 Of those 5000+, 100 had isolated bilateral hilar adenopathy (no other abnormalities on CXR). 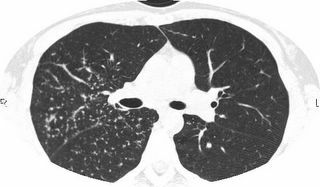 30 of the 100 with bilateral hilar adenopathy were asymptomatic, and all 30 of those had sarcoidosis. This is the basis of the concept of not requiring a biopsy for asymptomatic bilateral hilar adenopathy. As someone mentioned in the comments, pelvic lymph nodes occur in sarcoid frequently enough so that we did not go after enlarged lymph nodes in asymptomatic patients. My big worry is her reduced pulmonary function; however, this could have occurred 4 years ago and I would not have known it. So my plan: watch her for 3 months and repeat a chest CT (to look at the lymph nodes) and repeat the PFT's. If she has larger LAD or worsening PFT's, she buys a bronch with multiple biopsies to make a diagnosis. 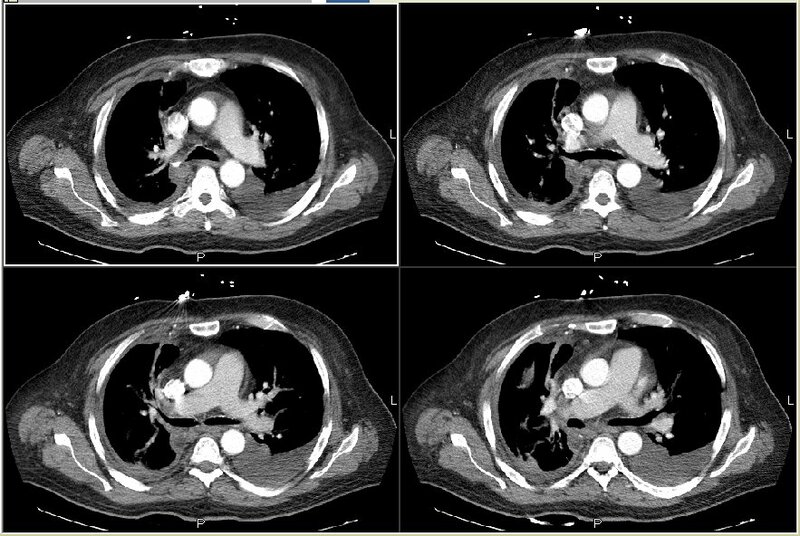 This is a 58 y/o man transferred from an outside hospital with significant dyspnea and orthopnea. 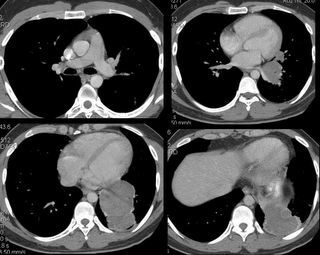 In mid-April he had a similar presentation with significant dyspnea and was found to have an empyema. 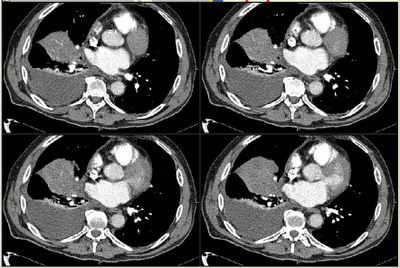 He was treated with chest tube thoracostomy and ABTx, had marked improvement and was D/Ced home on levofloxacin. Currently he has no fevers/chills/night sweats and has only a dry cough. PMHx: no previous lung Dz. +CAD, S/P PTCA. SHx: never smoked. Retired from management position. Current hobby is to work with rare woods and make pens. He always wears a mask. No use of Western red cedar. On exam, AAOx3. Good dentition. Decreased BS R base with crackles, egophony and dullness. S1/S2 RRR. Benign abdomen. 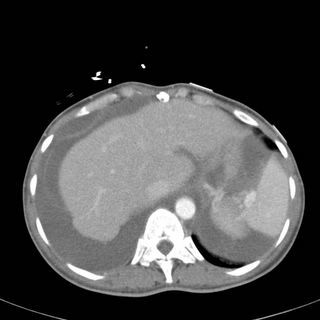 CT scan is seen below. 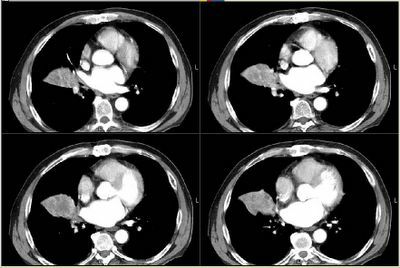 Besides comments on management and next step, what is the practice at your institutions RE: infusing thrombolytics via CT for empyema?